Jochen Hick’s intriguing look back at gay life in Berlin up to the present day paints an affectionate portrait of Germany’s capital city, but at the same time, it doesn’t shy away from pointing out that sometimes it is not always perfect. After WW2 the city was literally in ruins and the focus of its citizens then was on the daily struggle just to survive. With many Nazis still holding powerful bureaucratic positions, Paragraph 175 the provision of the German Criminal Code that made homosexual acts illegal, was still being rigorously enforced. It drove gay life underground as people lived in fear of being caught and jailed (about 100,000 were until the law was eventually abolished in 1994). However in 1969 things took a turn for the better, as at the same time the US LGBT community were celebrating the Stonewall riots, the German government set 21 as a legal age of consent for homosexuality, thus bringing gay men and women finally out of the shadows. Berlin was beginning to be a vibrant place to live : it was cheap and politically active and gay communes became all the rage in certain quarters. From having a lone gay Bar, others opened up, celebrities like David Bowie and Iggy Pop hung out there, and the new places even had clear windows where you could look in from the street. As gay men were happy to flaunt themselves in the streets, the new freedoms also caused some discord in the community too. Older gays so used to hiding were terrified that the openly gay flamboyant men would go too far and create an eventual backlash. The serious political part of the LGBT community disliked all the frivolity, and members of the lesbian movement didn’t like anything at all that was so heavily dependent on penises. What gave Hick’s film such authenticity was that he carried archival footage of some of the city’s leading gay figures such as Egmont Fassbinder the publisher, fashion designer Klaus Schumann filmmaker Rosa von Praunheim among others, and then interviewed them all now. 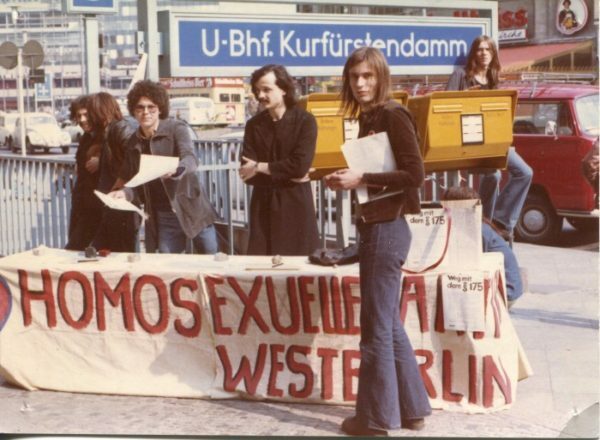 They represent a unique and stylish world that may have faded now, but quite rightly deserve being acknowledged for the role they played in helping establish Berlin’s vibrant LGBT community. The going gets tough and very emotional when the movie covers the late 1980’s and early 1990’s and how the AIDS pandemic ravaged the city . Like other gay communities around the world they come through this period stronger and determined to adopt a more zestful approach to life in general, but recovering from their losses and mourning their loved ones leaves an impact that they can, and will, never forget. There are the usual complaints that gentrification has spoiled the City by taking off some of its rougher edges. It’s hard to accept though that Berlin which was a hotbed for the punk movement, and has always been a haven for drag performers, and is still one of the ‘leather capitals’ of the world, will ever be anything less than wonderful.